On Jacob's Birthday, I did a little something for me. 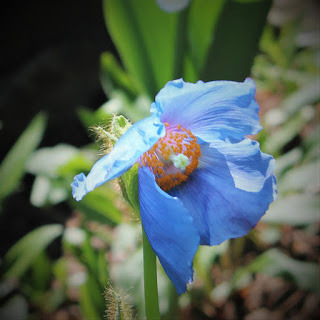 My friend Kathy had written, saying that the IMA (Indianapolis Museum of Art) had a Blue Poppy in Bloom in their gardens. They were having a big wingding Spring Blooms exhibit. I wanted to go. I've always wanted to photograph a Blue Poppy. But they don't grow here. I had heard that once some grew in St. Louis in their fancy Gardens. But they prefer it chilly, so getting them here in Indy is a little tricky. Somehow the IMA made it work. Well, I decided that Birthday Week is the Time to make the most of it. It was 18$ to go to the Museum, we had to pay to get in, just to walk around the Gardens. Ugh. But I was willing to do it, just to cross this Bucket List item off my List. So Kathy met me there shortly after they opened, we grabbed a very quick lunch in their cafeteria, and hit the path. 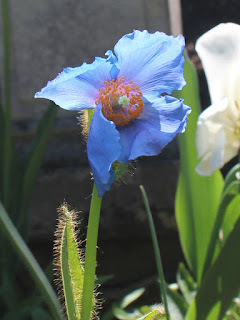 We were on a Mission to find the Blue Poppy. In the mean time, we found Lots of Pretties! Here's the Top 20. 1. I go on a Very Expensive Flower Walk. 2. 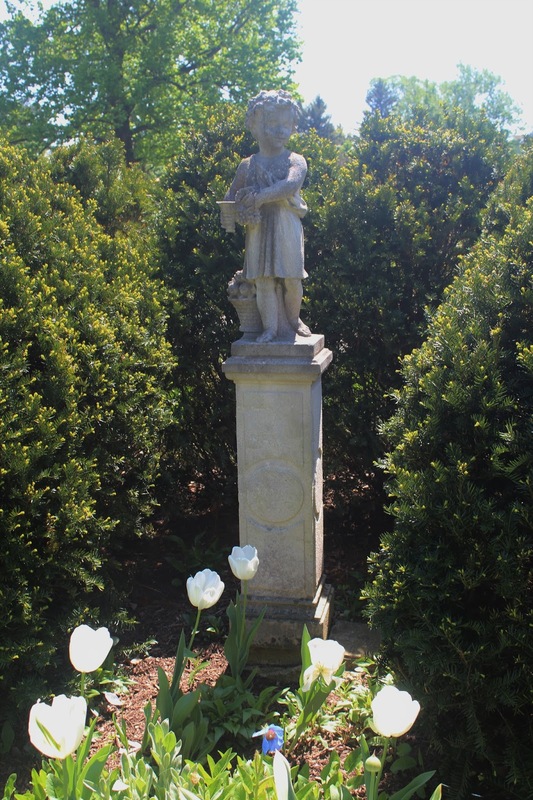 The Tulips were in Bloom. We found some varieties we'd never seen before. I love these pinks with orange variations, almost stripey. Gorgeous! 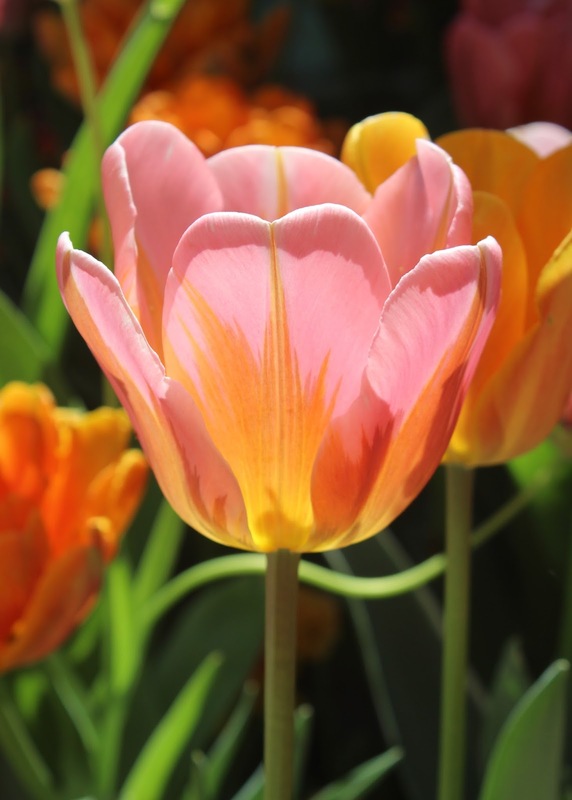 The early tulips were done, but a lot of them were still going strong. I love this line of pretties. 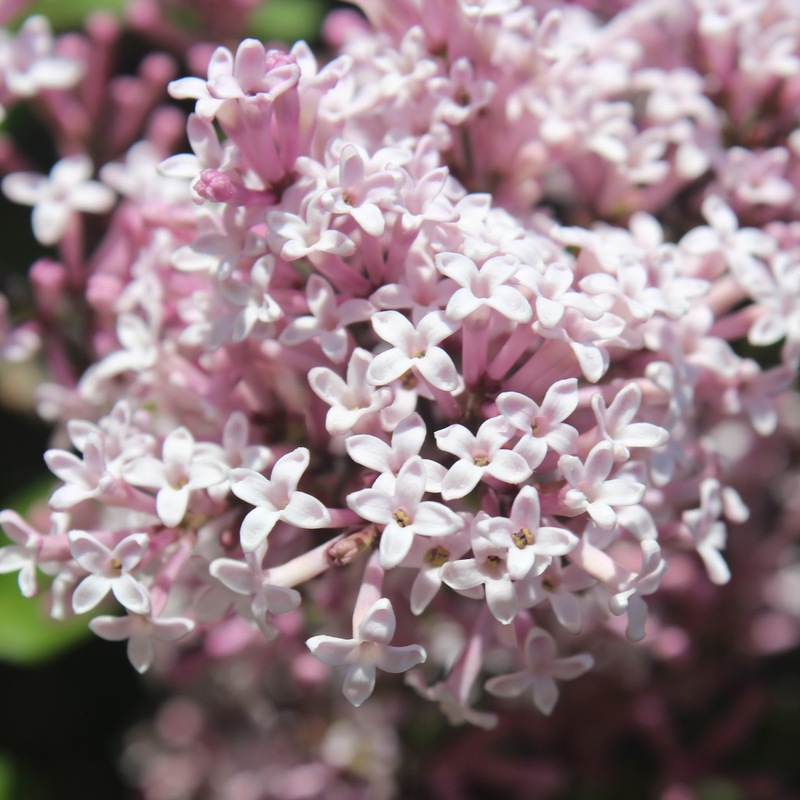 Near the Four Season Garden, we found a lilac blooming. This lilac had tiny blooming flowers, tinier than usual, but so good and stinky. 5. We found a Blue Poppy! We found the Blue Poppies Blooming among these hand size giant white tulips. 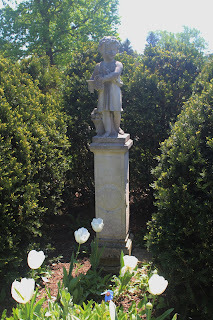 The first we found was at the base of a statue in the Four Seasons Garden. 6. A Good Closeup shot of a Blue Himalayan Poppy. 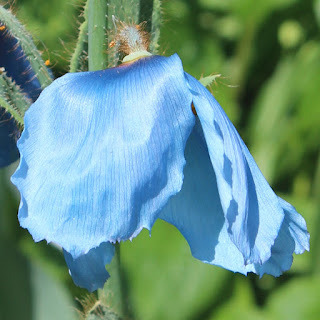 When I got close up to one Blue Poppy, it looked almost wilty. While did did near 80 degrees this day, they prefer cool temps. 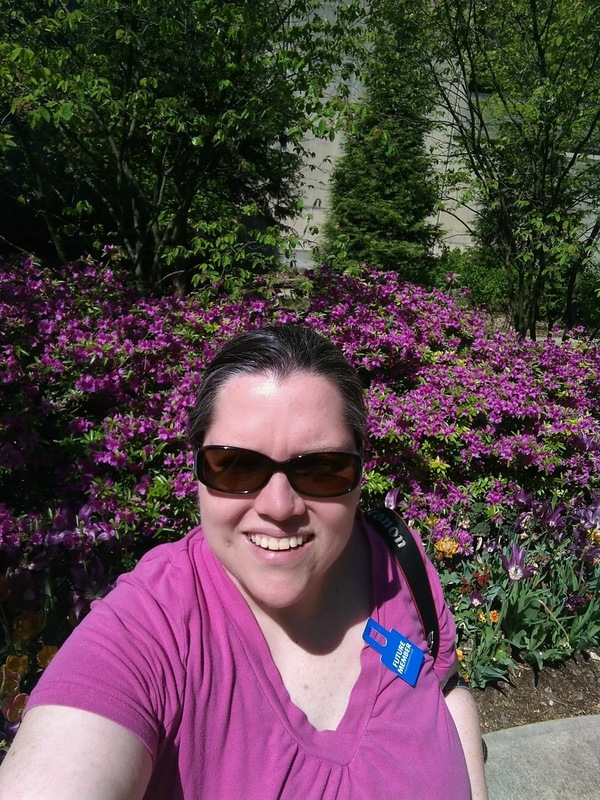 Their shade of Blue is the most perfect for a flower, and I think, very unusual, especially for Indiana. I love how silky they look up close. I wanted so badly to reach out and touch it. 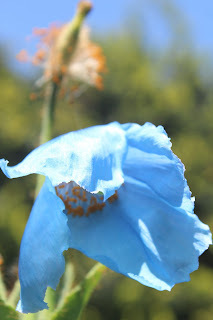 The stamens on the Blue Poppies ar Orange, but they face downward, it's a little hard to see. 9. My favorite Poppy shot. 10. Near a shady bush, a random pale pink tulip blooms. 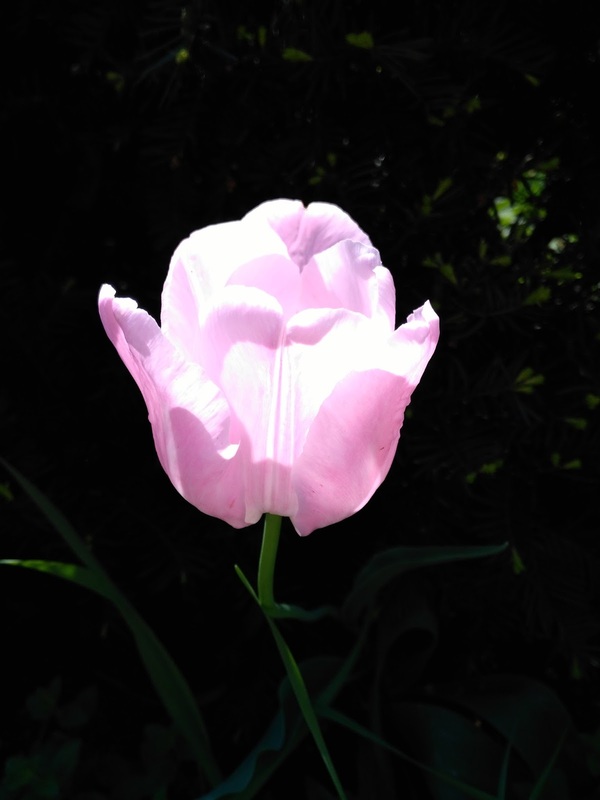 It was strange, most of the tulips in this garden were white, but this pale pink fella seemed so happy as he was stuck by the sunlight. The Lilly House grounds was where we used to picnic when we could come here for Free. 12. A Sea of Black Tulips. 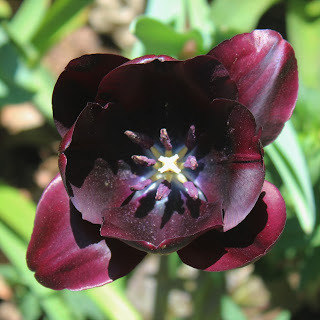 These tulips are so dark, they are almost black. Kind of really dark red or purple, but blackish. 13. A close up of a Black Tulip. This one is neat, because it's got 8 leaves, most of the time they only have 6. We found a separate garden by the Greenhouse. They said it was Temporary. But it was so pretty the way these little pinkies and oranges were glowing. 15. "When two friends are giggling in a nest, it's called tweeting." 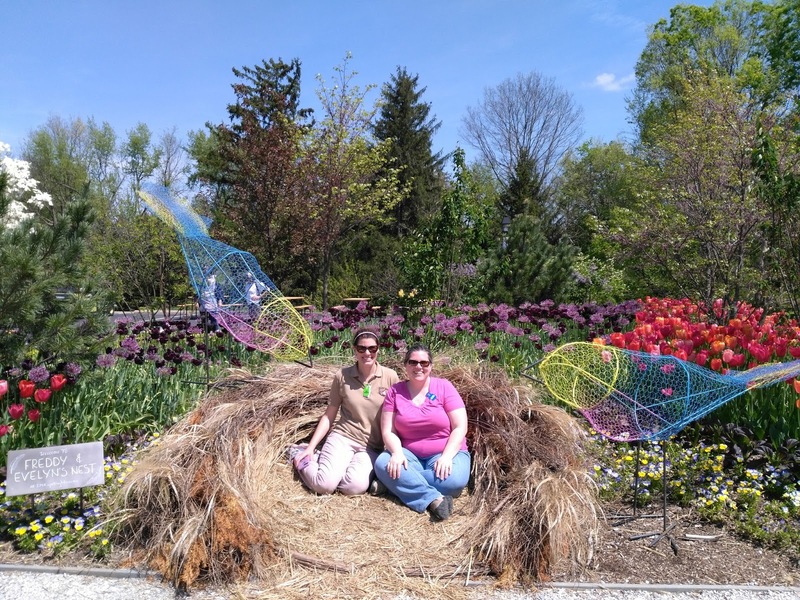 There was an piece of artwork by the Greenhouse of these wire mesh painted birds, and we could become part of the nest. I loved it. So we were taking pictures of each other in the nest, when ladies coming in asked to take our pictures. We let them, and giggled like teenagers the whole time. 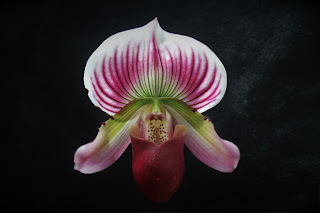 The greenhouse was full of Orchids. 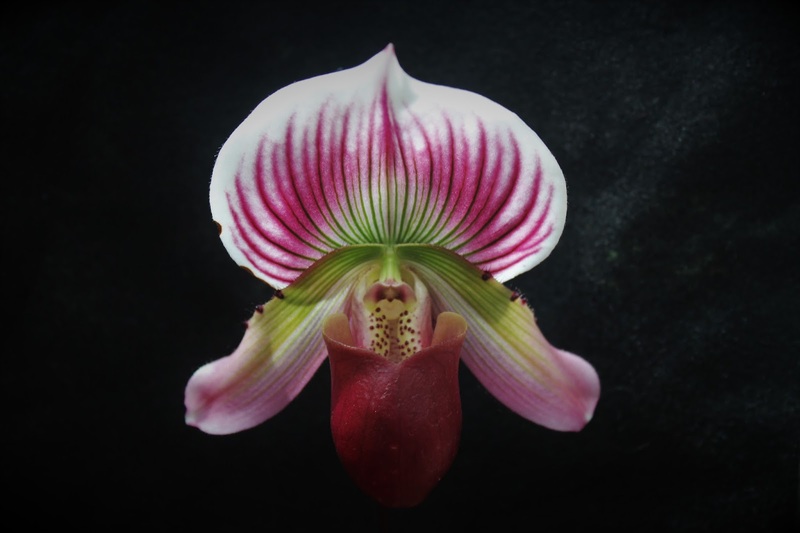 Orchid lovers are odd people, obsessive. I had an orchid, a blue one Eric got me for Valentine's Day. It survived until Fall. I don't think my Green Thumb is green enough to keep Orchids alive, not while I have little kids. This one was really neat though. He won Blue Ribbons at the State Fair and other contests. I brought a piece of felt to create a background for flower photos, but when the sun was at the back it goofed all my photos up. This was the only one where it looked good. When they water the begonias in the greenhouse, little droplets held on tight. It took me a bit of time to get a good photo of the droplet in the begonia. I loved how this happy orange one turned out. 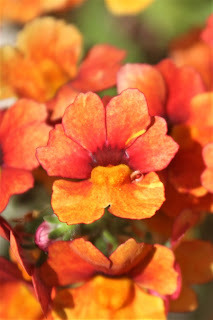 Kathy was trying to capture this pretty little flower in a bucket on her camera phone, but it wasn't working. I got decent shots, I liked this closeup though. Afterwards, I couldn't find what the flower was. So I posted it on the IMAs Facebook Page, and they told me. Hooray! This was the only sculpture we saw on our adventure. And Kathy had to kind of drag me over by it. 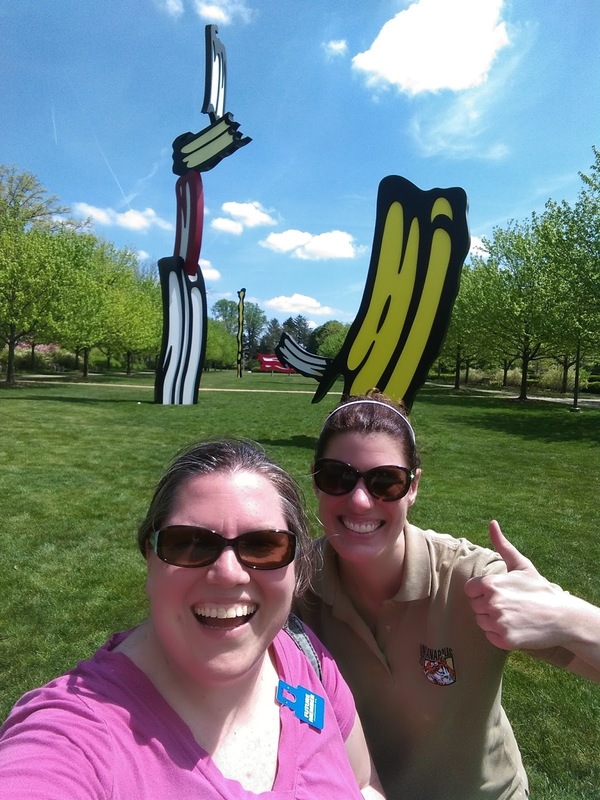 But she said, we needed to actually see some Art, for the amount we paid to get into the Gardens. So here we are, by Five Brushstrokes by Roy Lichtenstein. I think it looks like Bacon. Rainbow colored Bacon. I don't see the big deal. When I asked the IMA about the flowers, they were kind and said, That's what they were here for. Hmm... I often feel that way about my Oils. But I don't find that often elsewhere. I kind of liked their attitude. I don't know if I like it enough to not be pissed I spent more than $30 to take pictures of flowers. Or to go back. Still it was a neat adventure. And I got to see the Blue Poppy. That was Pretty Amazing, and we had a Good Time. We'll see if I ever go back.